Abstract: A middle-aged Warmblood gelding presented for soreness and stiffness as well as a mild right front lameness. Following lameness workup and multiple recheck examinations involving radiographs and bloodwork, a list of diagnoses included: contracted heels, osteoarthritis in both tarsi and forelimb coffin joints, neck stiffness and pain, and vitamin E and selenium deficiency. 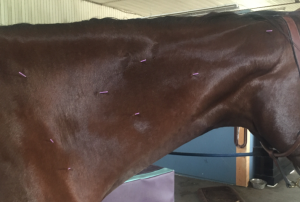 Multiple treatment modalities, including acupuncture, were used to treat Ace and resulted in a sound and healthy horse that can now continue to perform its job. Ace, a 12 year old Warmblood gelding, presented on May 23, 2017, for a lameness evaluation. He has spent the past few winters in California and the rest of the year is spent at a stable in Calgary, Alberta, doing English pleasure. The owner noticed that when he arrived home from Arizona in the spring, he did not feel like himself and instead felt quite stiff and sore. She felt as thought he was somewhat lethargic when being ridden, and had noticed that he tends to favor his right front (RF) limb. Ace had his forelimb coffin joints and lower hock joints (tarsometatarsal and distal intertarsal) medicated with anti-inflammatories the previous spring after osteoarthritis (OA) had been diagnosed in the joints on radiographs. Owner felt that he had improved with the joint injections. Ace lives in a large stable with daily turnout. On initial examination, Ace was quiet, but alert and responsive. Vital parameters were within normal limits. Ace had a body condition score of 5/9 however had poor muscling along his topline. Both front feet had contracted heels and he was positive for hoof tester sensitivity across his frogs and heels bilaterally in front. On limb palpation, he had mild coffin effusion in his left front (LF), and mild effusion of the medial femorotibial joint of both stifles. His range of motion in both hocks was decreased. Ace was very sensitive to palpation of his neck bilaterally, especially his caudal cervical region. He also showed sensitivity to palpation the cranial aspect of the shoulder. Range of motion in his neck was significantly decreased and worse towards the left side. No significant findings on palpation of the thoracolumbar spine and musculature; however he was sensitive to palpation of his gluteal muscles and sacroiliac (SI) region. Myofascial palpation revealed sensitivity through neck bilaterally, especially over cervical vertebrae. A couple trigger points were noted in the caudal cervical region, specifically LI 17 and L1 16 bilaterally. Gluteal muscles were tight and trigger points were noted along the bladder meridian from the lumbar spine through the sacroiliac region to the level of the tail head. Ace had a short, stiff gait at both the walk and trot on straight lines and circles. He showed a mild occasional RF lameness on the right circle. Ace trotted and cantered with his head held low and protruding out and appeared to be holding it that way due to discomfort, specifically in his neck. No abnormalities noted on neurologic examination. Bloodwork revealed vitamin E and selenium deficiency (vitamin E was critically low). Cervical radiographs were offered to assess for osteoarthritic changes or other abnormalities however owner declined. Following initial examination, where such significant neck pain was discovered, acupuncture treatments were offered to the owner to not only improve the discomfort in the neck, but also the entire body. The muscling through the neck was very tight with numerous trigger points. The acupuncture treatments on the neck will not only relax the spasms present in the musculature, but will also override the pain pathways present. Dry needling was used initially, followed by the addition at electrical stimulation (E-stim) treatments, for the second and third acupuncture sessions to achieve activation of endogenous opioids, serotonin and norepinephrine through peripheral, spinal and supraspinal mechanisms. 1) Neck Pain: muscle soreness and cervical articular facet osteoarthritis. 2) Short/stiff gate: osteoarthritis, vitamin E/selenium deficiency, Lyme disease, foot soreness. 3) Gluteal/SI sensitivity: SI ligament desmitis, gluteal muscle soreness (front-end compensation). Due to lack of cervical radiographs, articular facet arthritis could not be confirmed. However, due to significant sensitivity on palpation of the cervical vertebrae, as well as the severely decreased range of motion, it is very likely that osteoarthritis is present within the articular facet joints bilaterally, especially in the caudal cervical region. Furthermore, this could be contributing to the mild, intermittent RF lameness but would require nerve blocks to confirm. Acupuncture was used to treat the cervical discomfort as well as the taut muscles throughout the gluteal muscles and the sensitivity surrounding the SI region. E-stim performed from LI18 to LI 16 bilaterally at session 2 (10 minutes) and 3 (12 minutes). Some dry needling was performed in cervical muscles where trigger points were found. Ace also received massages from a local equine massage therapist, as well as chiropractic adjustments. Furthermore, Ace was supplemented with vitamin E and selenium. Ace was a great horse to perform acupuncture on because not only did he thoroughly relax and enjoy his treatment, there was also a significant improvement noted in his range of motion of his neck by the end of the first session alone. By the third session, he was significantly more comfortable through his neck and the short/stiff front-end gait had resolved. Combined with the other therapies listed above, the degree of comfort and motion that was restored to his neck was very improved. The muscles in his neck became more developed and relaxed. This was a great case to use acupuncture on and I learned how effective this could be in managing neck pain, or any type of chronic pain, in horses. 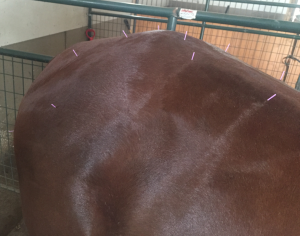 I now recommend that all horses receiving steroid injections in the cervical facet joints receive acupuncture between injections. No adverse events were noted with acupuncture treatments in this case. However, if performing acupuncture on a horse with severe neck pain in the future, that was also neurologic, it would be prudent to be very cautious as treatments could lead to muscle relaxation, which could decrease the stability of the neck and potentially worsen a cervical lesion causing worsened neurologic deficits. In this case, no neurologic deficits had been noted on the original examination and therefore this was less of a concern. American Association of Traditional Chinese Medicine. (2017). Review of Equine Cervical Pain. [online] Available at: https://aatcvm.org/JournalFlash/vol11no2/11review.pdf [Accessed 17 Sep. 2017]. le Jeune, S., Henneman, K. and May, K. (2016). Acupuncture and Equine Rehabilitation. Veterinary Clinics of North America: Equine Practice, 32(1), pp.73-85. Still, J. (2015). Acupuncture Treatment of Pain along the Gall Bladder Meridian in 15 Horses. Journal of Acupuncture and Meridian Studies, 8(5), pp.259-263. Zhang, R., Lao, L., Ren, K. and Berman, B. (2014). Mechanisms of Acupuncture–Electroacupuncture on Persistent Pain. Anesthesiology, 120(2), pp.482-503.